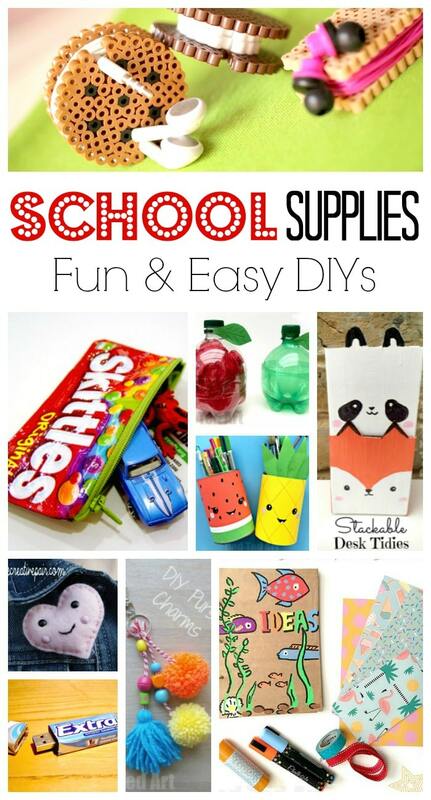 I have ALWAYS loved stationery, school supplies and Back to School Crafts. I remember as a child collecting erasers and stickers. Later moving onto pencils and gel pens. I loved browsing our stationary shop for cute notebooks and fabulous back back charms. My friends and I used to decorate our notebooks (I remember one Notebook covered in chewing gum wrappers, it was bright yellow and I loved it). 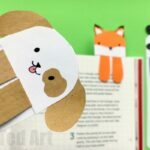 And now, as our craft and stationery supplies explode in our house, and my kids get into cute school supplies, we love these School Supplies DIY Ideas more than ever! A great School Supplies DIY not only is fun to make, but it can also save a lot of cash – especially during that expensive “back to school” period when the kids need new shoes, sport kits and back packs. 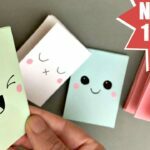 I hope you find these Back to School DIY ideas helpful and that you too have a go at making some of these (they also make great Summer Crafts to keep the kids busy – or if you are running a Summer Camp, even better, the parents will love you for it!). We love pencil holders or pen pot diys. They are the quickest and easiest way to get your desk organised and get ready for back to school. We have rather a LOT of pen pots here at Red Ted Art, living in our “art trolley”. We sort our pens into – pencils, crayons, coloured pencils, felt tips, sharpies and ball point pens. We have pen post for paint brushes and paint pots for scissors and rulers.. yup. We have a LOT of stationery supplies and they ALL need be kept in order somehow! Stackable Fox & panda pen pot (juice carton upcycle). These are great for erasers and pencil sharpeners too. 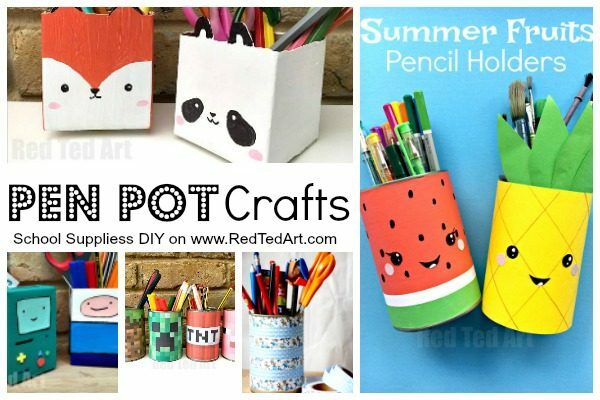 The majority of our pencil holder DIYs are indeed made from tin cans! That is because they are so quick and easy to decorate, are sturdy, don’t fall over and, well are practical and cheap too. So many GOOD things about tin cans. Here are our favourite. 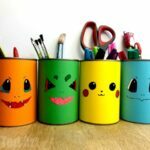 Halloween Tin Can Pencil Holder – these actually started out as a Tin Can Bowling game for Halloween, but ended up as our Pen Pots in our art trolly. LOVE them. Minecraft Pen Pots – we created these using a free printable designed especially for you. Making these mine craft pen pots super quick and easy to make. 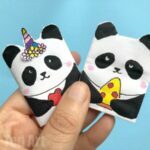 Adorable Kawaii Pencil Holder – these are super quick and easy to make and a great for SMIGGLES fans looking for an easy Smiggles DIY. Easy gift wrap tin can – I love this method, as it is indeed ridiculously easy and quick to make and because you are using gift wrap, you can chop and change your desk decor whenever it suits you. It really just needs relatively small strip of wrapping paper! 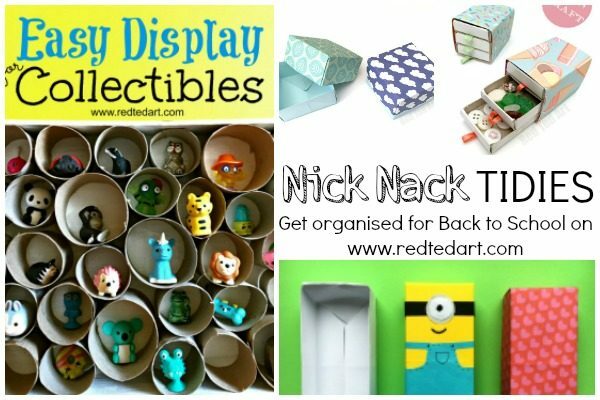 There is of course more to desk tidies then just pen pots… you will need little boxes and bowls for all those little nick nacks. You may want a nice money box, or a display for all your trinkets. Here are the more “general” DIY Desk Tidy ideas! Matchbox Mini Drawers (great for little trinkets) – no glue DIY too! 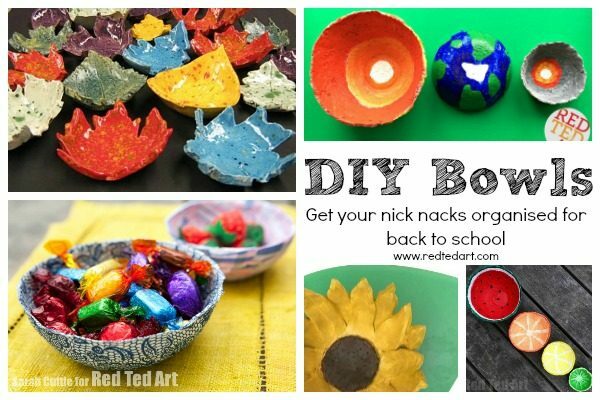 DIY Bowls make great desk tidies (and ahem great gift ideas too, so be sure to bookmark these for someone’s birthday, teacher’s gifts or Christmas!). They are perfect for all those little nick nacks such as erasers, pencil sharpeners and paper clips. Again we have a good selection of homemade bowls. All inexpensive and thrifty to make too! 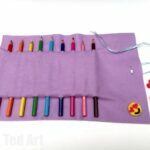 Now my kids adore pencil cases.. and I know they want me to make them a number of pencils cases (especially if they are smiggles inspired, ha!). 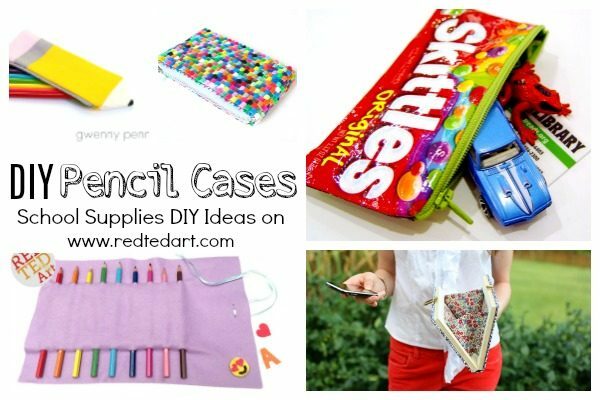 For now this “pencil case DIY” section is a bit sparse.. but I promise, that I WILL be adding more in due course. If you have a book nerd in the house make this book clutch / pencil case! And this “Pencil” Pencil Case is just adorable too! Another favourite of mine are pencil topper DIYs. Pencil toppers are a great way to snazz up a “boring” or “old” set of pencils, pens and colouring pencils. They also make fabulous little gifts to friends at the beginning of the school year or teachers at the end of it. 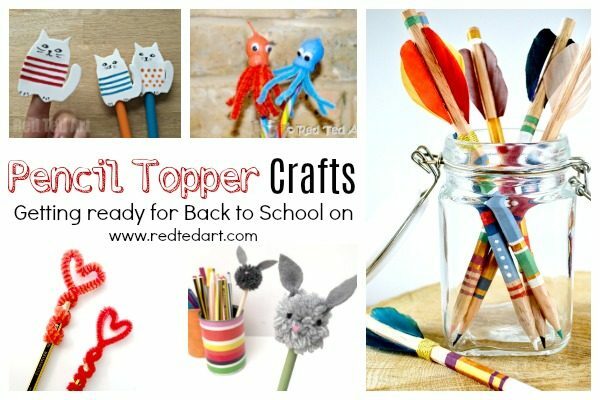 So no back to school DIY list would be complete with a set of easy and fun pencil topper ideas. As mentioned, I have happy memories of collecting chewing gum wrappers (all of the same brand, ha!) and carefully sticking them on my notebooks for school. I used to love personalising my stationery like that. 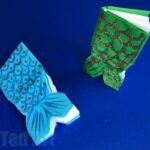 Here is our set of notebook ideas – some for making your own notebooks or art journals from scratch, others are mini notebooks that you can sneak into your pencil case or give to your friends as small gifts. 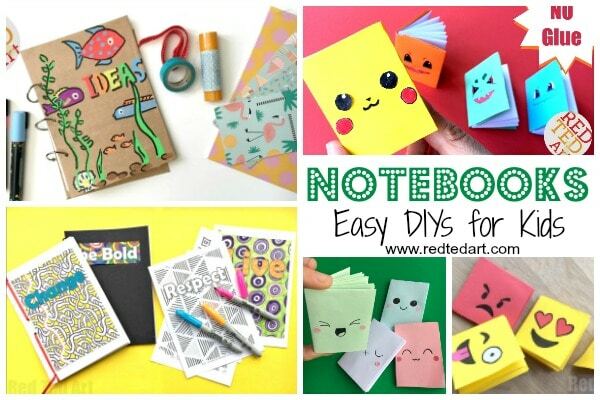 Again, as my kids love for notebooks grows, I will be adding some more notebook DIYs over time. 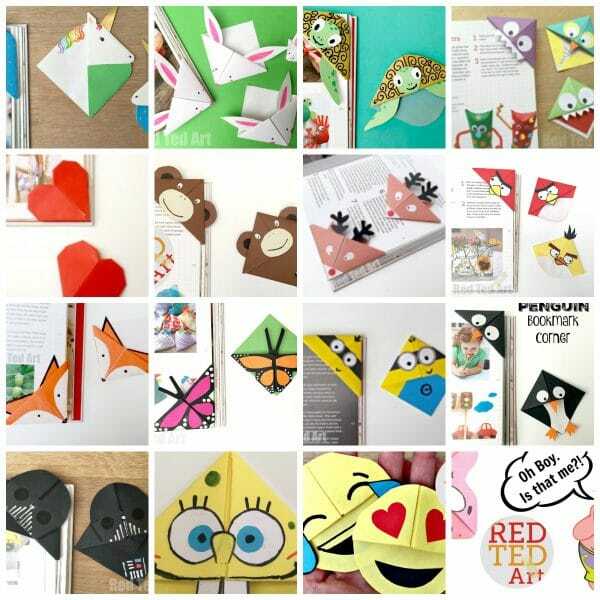 So please do bookmark this section too (yes, Smiggles inspired notebooks have already been request….)! We can’t get enough of these adorable Paper Minion Notebooks. Just fabulous and a must see for all Despicable Me fans! These Back Pack Charms or Zipper Pulls or Key Chains (you can use them as any) are a great craft for Summer Camps, as they are fun to make, can be made in groups and of course are “useful” (particularly if used as Key Chains). Again, I don’t know about you, but my kids have about 15-20 Back Pack Charms dangling off their school bags at any point in time.. and they love to collect them on holiday, from their favourite brands, but also to make their own charm DIYs! 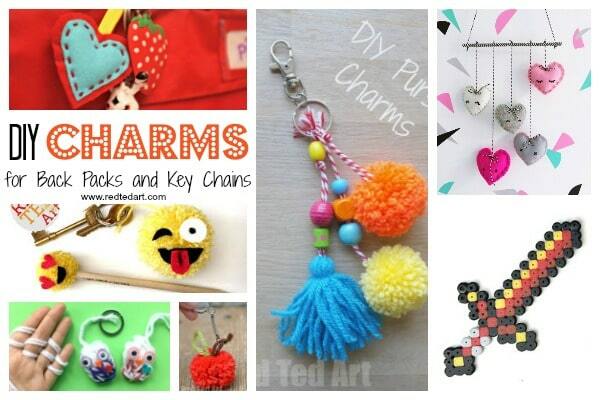 We love anything from Pom Pom charms, to hand sewn charms. Now the key thing to these key chain diys, is that they need to be DURABLE. Key chains and zipper pulls need to be able to take a lot of wear and tear. Here are our favourite Zipper Pull DIYs! So. 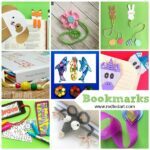 You KNOW that we love bookmark ideas and that here on Red Ted Art, we possibly have the most extensive collection of Corner Bookmark designs, but we also have a set of “regular” creative DIY bookmarks ideas, if you are looking for a bit more Bookmark Idea variety. Similarly we love these “book inspired” bookmarks (perfect for World Book Day too! And of course our “general” Bookmark Ideas too! As my kids get older, I noticed new and wonderful School Supplies “creeping in”… and I will start collecting here for you today. There are two lonely ideas for now.. but more to come soon, again, I promise! Get accessories with this cute and easy how to make a scrunchie tutorial! So. 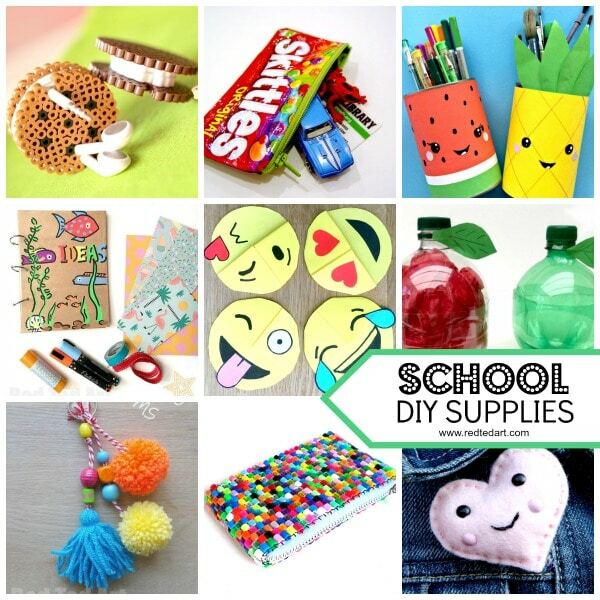 I think that that is it for our School Supplies DIY Ideas for NOW…. if there is anything really obvious that I am missing and that you would like to see, please do email me or leave a comment down below! I always love hearing your feedback and suggestions. Often the best ideas come from YOU my lovely readers. In the meantime, I hope you have a good “back to school” preparation time! 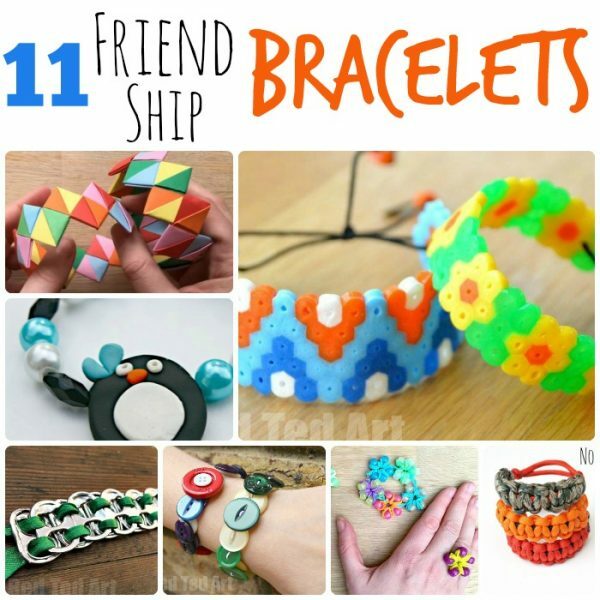 If your kids are excited about seeing their friends again after the summer break, they may also like these DIY Friendship Bracelets! A great little gift idea for back to school. Cheerio! And happy School Supplies Crafting! Need more ideas for back to school?! Take a look at these fantastic ideas! Maggie: My grass is growing way too high, my house is dusty, and I am happily making so many of these little crafts you’ve shown. You always have the best! Thanks.